It’s been a few years since we picked up our Instant Pot – over that time, I have slowly migrated away from using the crock pot. Don’t get me wrong.. I still love and use it – but not nearly a fraction of as much as I used to. One of the most popular meals in our house back in my crock pot days was one-pot turkey and stuffing. 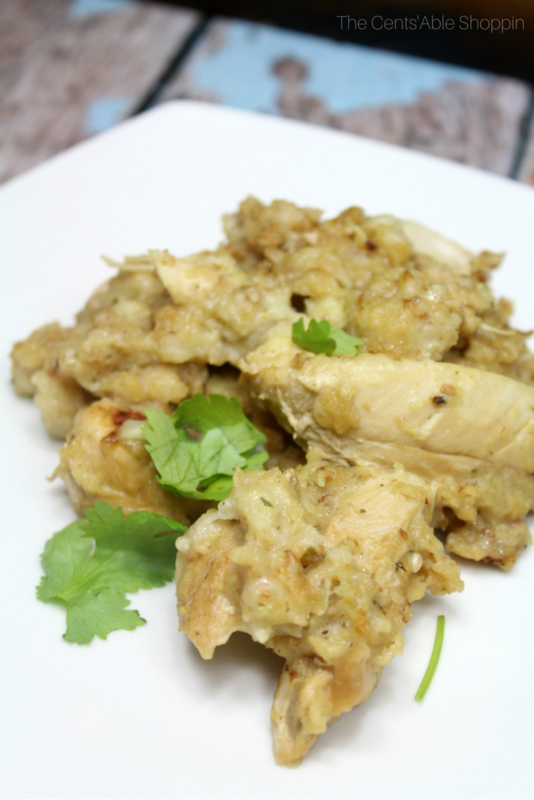 Or.. chicken and stuffing — since chicken breasts are usually what we have for the majority of the year. It was always relatively easy to make, and everyone ate without complaint – if there were leftovers, they were usually gobbled up fairly quickly. 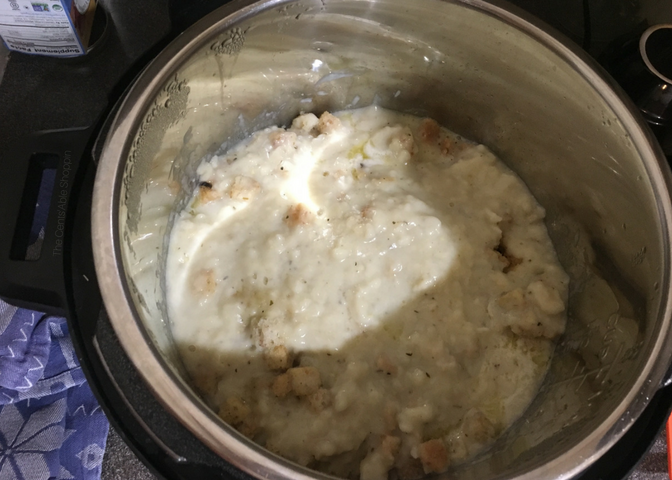 It wasn’t until this week that I actually thought about that one pot chicken and stuffing I used to make in the crock pot and wondered if I could make it in our Instant Pot – I knew it wouldn’t take nearly as long, and though I knew what I needed, I wasn’t sure if the measurements would be the same. A little trial and error never hurt though — so we gave it a whirl and it turned out fabulous, super easy and incredibly delicious. This chicken and stuffing is versatile – change it up to suit your own family and what works best for you. Saute your veggies – we used onions, celery and garlic, and 1/4 C. butter. Once the veggies have sauteed in the butter, add your chicken, and chicken broth. Cook on high pressure for 15 minutes. Follow with a quick release. Pour your stuffing on top of the chicken and even out with the back of a spoon. Take the other 1/4 C. butter and cut into slices – place on the top of the dry stuffing. Then, pour the cream of chicken soup over the top and smooth out as evenly as you can. Lastly, pour 1/2 – 3/4 C. of water over the top (the difference isn’t much but 3/4 C. will give you very moist stuffing). Lock the lid and set the timer for 4 minutes on high pressure. Once it’s done, open the lid and give it a few good stirs. That’s it! Serve it up..
Let me tell you a secret though — it is SO hard to get a GREAT picture of chicken and stuffing – it kind of looks like a blob – right?! Obviously I’m not a food blogger… I love to cook, love to make soap.. and love to sew, but taking pictures is not my forte. You’ll have to trust me on this – this is a keeper. Ultimate comfort food for a busy night. We used cream of chicken to make the stuffing really moist – I always make my own and love/prefer it that way (less additives and much better for you); however, if you prefer canned, give it a shot. I have used this recipe to make my own for years and it works super. I started with chicken tenderloins that had been thawed out in the fridge all day – feel free to start with frozen chicken if it works better for you. 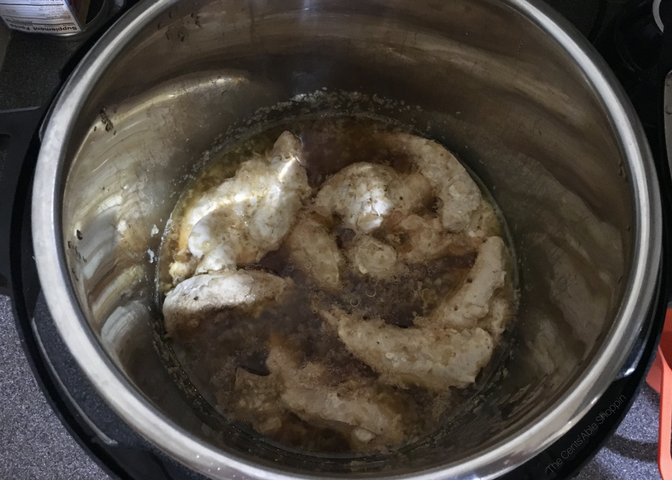 However, you may have to adjust your time – I felt comfortable putting my thawed tenderloins in the Instant Pot for 15 minutes (which went by incredibly fast). I used one bag of organic stuffing that was leftover from the family at Thanksgiving. 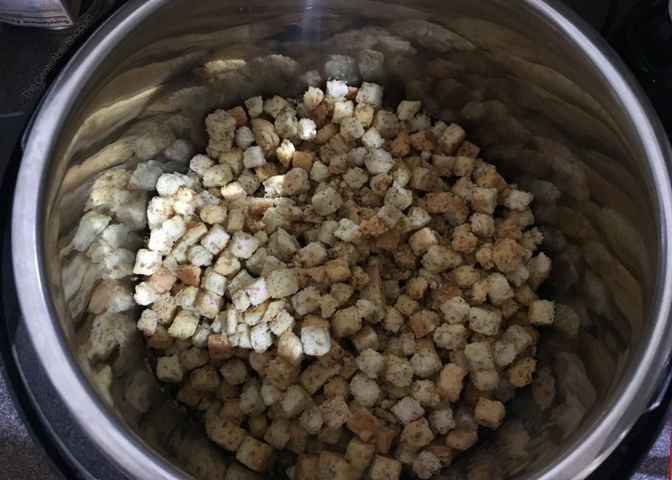 If you have day old bread, sourdough or a hearty bread, feel free to dice into small cubes provided it has dried out enough to use for stuffing. You could probably try decreasing the butter – though I’m going to tell you that I am probably one of the few who believes that pastured butter is incredibly healthy – in moderation of course 😉 We make our own – it’s so much better than what you’ll find in the store. If you are looking for more Instant Pot recipes, find over 100 deliciously yummy Instant Pot recipes – from main dishes, to seafood, sides, Mexican & more. If anything, this recipe is comfort food at it’s finest ~ and makes great leftovers the next day. If you are serving this with a side of steamed veggies (perhaps broccoli), make sure you steam that first, then remove and set aside. *Always try and use organic ingredients whenever possible. An easy, one pot chicken and stuffing meal that is perfect for busy nights! 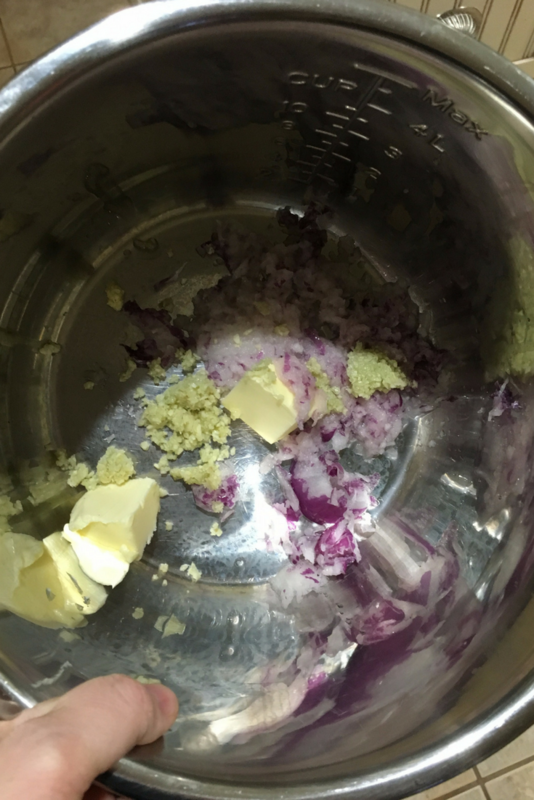 In your Instant Pot, combine 1/4 C. of the butter along with the onion, celery, and garlic and saute for 1-2 minutes or until soft. Turn off the saute feature and lay the chicken in the pot directly on top of the onions/garlic/celery. Pour 1 C. of broth over the top of the chicken. Place the lid on the IP, close the valve, and set the pot for 15 minutes on high pressure. Once the pot beeps done, release the pressure. Pour 1 bag of stuffing mix over the top of the chicken, top with the remaining 1/4 C. butter (sliced into pieces). Pour 1 1/2 C. of cream of chicken over the top - even out with a spoon. Pour 1/2 - 3/4 C. water over the top of the cream of chicken. Place the top on the Instant Pot, seal the valve and set to 4 minutes on high pressure. Once done, release the pressure, and give the pot a good couple of stirs to combine - season with salt/pepper and serve.